Death by Misadventure, the first in the “ALEXIS J. SMITH—Discreet Inquiries” series, followed by Bad Blood, Russian Roulette, and Prescription For Murder. With Bad Blood I have read this entire series and really enjoyed every one of them. There are two cases to be solved by P.I. 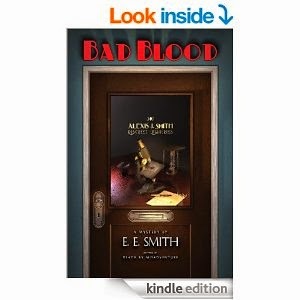 Alexis J. Smith in this short but action packed novel which really can be read as a stand alone. Of course you probably will want to read them in order-many of the same characters do reappear. About the book below is about all I am going to tell you - I don't want to give anything away. Just know that The CIA, FBI, MI5 and the KGB somehow get involved. Poor Harry-a Scotland Yard detective who really likes this American from across the Pond is forever trying to get her out of trouble! Alexis J. Smith, a young private investigator, returns to California after a case in England where she was a witness to murder—although the British court ruled it "death by misadventure." The dead man's overbearing sister, Monica Beck, is her first office appointment. It soon becomes clear that there is bad blood between Monica and her stepmother, Francine Faraday, and Lexie finds herself in the middle of a family feud over a valuable necklace that has gone missing. She barely has time to solve the mystery of the missing jewelry, and heal the rift between Monica and Francine, before she is called back to England to work on another case with her friend, Harry Hawkins of Scotland Yard. It seems that Lexie's old forensic science professor at Sacramento J.C. is teaching a course at Cambridge and raising alarms by sounding like a communist. More worrisome yet, he has supposedly discovered a formula for artificial blood, worth millions to any country that could get exclusive rights to it. The United States is in a Cold War with the Soviet Union, and there is fear in both the US and Britain that the professor will sell his formula to the Russians. Her assignment is to prevent that from happening. Evelyn Eileen Smith resides in the San Francisco Bay area and is an award-winning playwright of more than a dozen plays. The debut novel, Boardinghouse Stew, was inspired by her own real-life experiences working in a boardinghouse in Sacramento during World War II. Times Like These is based on more real-life adventures through the end of WW II, six years of peace, and the beginning of the Korean War. In her next book, In Love and War, Evelyn shared her experiences as a young bride during wartime and how decisions made in haste affected her entire life. She debuted as a mystery writer with Death by Misadventure, the first in the “ALEXIS J. SMITH—Discreet Inquiries” series, followed by Bad Blood, Russian Roulette, and Prescription For Murder. I received an Uncorrected Galley of this book for review purposes. All opinions expressed are my own honest opinions. For more information please check my Disclosure Statement. Our giveaways are in no way sponsored or promoted by Facebook. This is another one that my husband would love. You mentioned all his favorite things like FBI and KGB! This sounds like an interesting read indeed along with the others also. I will have to start reading them all. I love the mysteries like this one. It seems there is a lot of action which is good. Thanks for sharing. I'll have to mention this series to my dad, just the types of books he loves to read. My Mom would love this book. This mystery sounds very intriguing and suspenseful. I think this will be an interesting read. Thanks for sharing. I will have to check out this book, it sounds intriguing. My husband would love this book. I'll need to get it for him soon! I think that I would enjoy this book. I just finished Sum of All Fears by Tom Clancy, so I am warmed up to this type of story! My finance said he would really like to read this book. He is such an avid reader and he loves your reviews. My Mom and I both love a good mystery. She's always looking for new titles and authors, I'll have to see if she's familiar with this one. This would be perfect for my mother! She loves this type of genre! CIA, FBI, MI5 and the KGB!? That's some heavy hitters all wrapped into the book! You know some serious stuff has got to be going down when they all get involved! My husband doesn't read much but I think he may like this one. I'm going to share it with him! Sounds like a really fun read. Anything with someone from Scotland yard is always good for a few laughs too. Sounds like an intriguing mystery! Seems like a good read. I am always up for a good mystery! Thanks for sharing! As for the comment, above, about all those spy agencies working together -- if you read the book you will see that they DON'T. The FBI hates the CIA and vice-versa, Scotland Yard hates MI5 and vice-versa, and the KGB hates everyone!